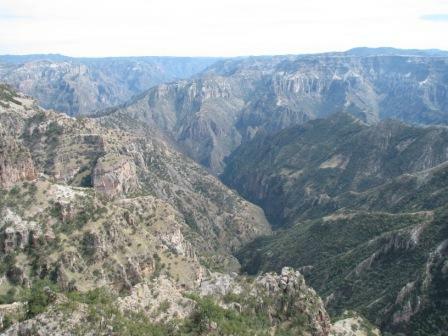 The Copper Canyon, or Barranca del Cobre, is located in the Sierra Madre Mountains in the state of Chihuahua in northern Mexico. Dwarfing the more famous Grand Canyon of Arizona in both length and depth, it is over 50km long and consists of a series of gorges which are up to 2,000 metres deep. The canyons form a breathtaking spectacle with some of the most impressive being Urique, Batopilas, Sinforosa and Cobre. The Copper Canyon can be explored on its famous railway (see separate entry) or by exploring on foot from some of the towns and villages on route. Creel is a popular town from which to explore the canyons and some spectacular rock formations and waterfalls nearby. Dividadero and Cerocahui provide probably the best single viewpoints into Urique Canyon where you can stand right on the edge of the precipice and stare up to 2,000 metres into the valley below. Organised group tours: Click here to see 5 tours to Mexico which may include Copper Canyon.